Still a newbie, but I'm liking zucchini spaghetti! Also, my first glance at that gave me a fleeting visit of the Flying Spaghetti Monster. Have you been touched by his Noodly Appendage? I had to search online for what a Spiralizer is, and that seems like a fair bit of work, but hopefully the end result tastes good. So I googled it and it looked neat so I got one. It's actually super easy to use and fun. 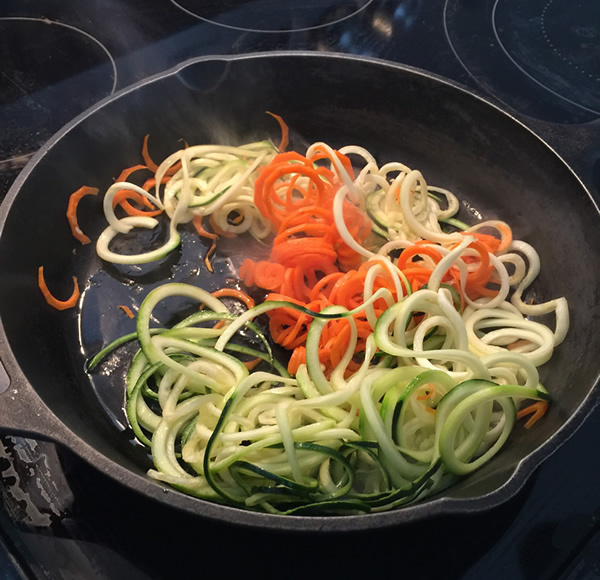 The secret is not overcooking or undercooking the zucchini noodle. I had them with spaghetti sauce and they were great! I believe this represents a fork in the Flying Spaghetti Monster religion, noodly goodness not made of pasta! Heresy perhaps! Stop being such a bigoli and pici on me! But I will be a bavette little Sagnarelli and grow a pair of testaroli and penne this reply to you... there is room in this part of the quadrettini for all kinds of noodly goodness, if we all stand al dente! Popped by to say 'howdy'... just in case you thought I was gnocchi on Heaven's door.